No kitchen garden is really complete without a tasty assortment of tomatoes, peppers, and eggplants. These mouthwatering vegetables are the highlight of the summer garden, producing armloads of produce that can be savored fresh from the garden, or processed for later use. All three are easy to grow, requiring only a sunny kitchen garden spot, some fertilizer, and regular watering. It's hard to believe there was once a time when people were afraid to eat tomatoes. Called "wolf pears," tomatoes were originally scorned by gardeners who believed the red fruits were poisonous. Luckily, however, some bold gardener decided to tempt fate and eat one of these mysterious fruits. 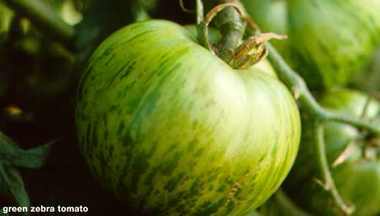 Since then hundreds of varieties have been developed and the tomato has climbed to the top of the vegetable charts. Learn more about tomatoes here! Eggplant is a versatile crop, blending easily into a variety of recipes and menus. It's a relative of the tomato, that comes in a surprising array of sizes, shapes, and colors. If you think all eggplants are giant purple, egg-shaped blobs, you've got a big surprise coming. 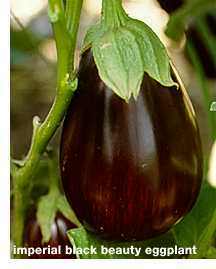 Learn more about eggplants here! 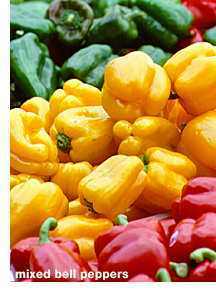 Peppers have the most dramatic range of color, shape, and taste. Their shiny skins and exotic shapes make them as beautiful as they are flavorful. From fiery red chiles to mild yellow sweet peppers, there's a pepper for every palate. Learn more about peppers here! I have never grown eggplant, but they just look soooooooooo good fresh from the garden I just might have to try it!